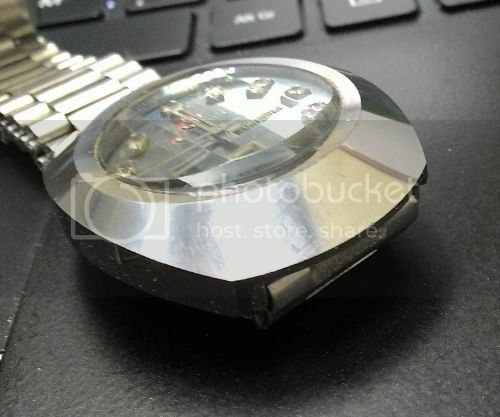 TimeZone : Watchmaking & Repair » Refreshing a Rado Diastar case. 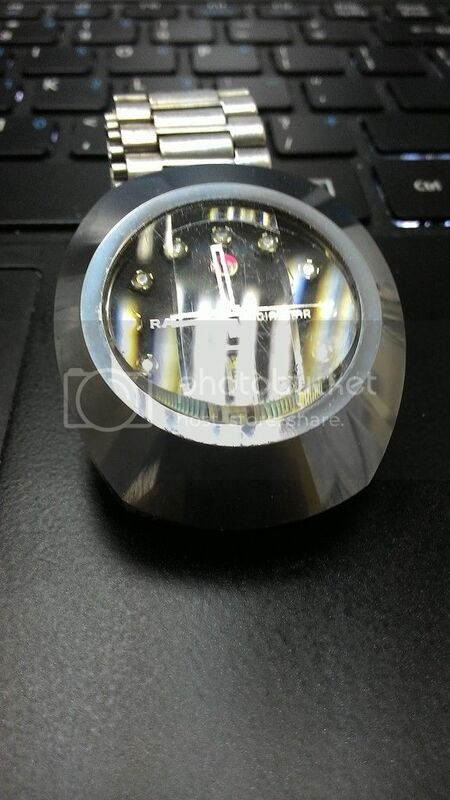 Has anyone had any success polishing a Tungsten carbide Diastar case? 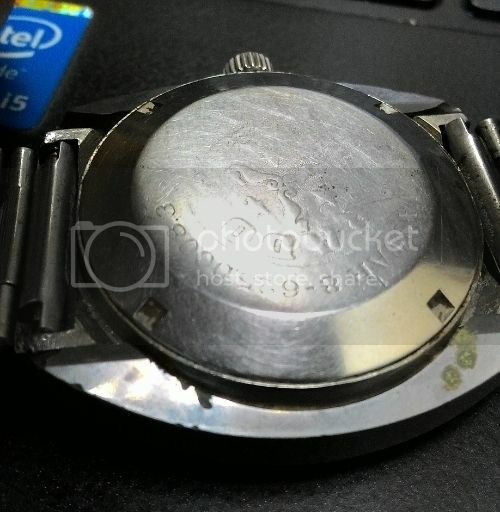 I have an older version with no really distinct scratches but the case does not have the 'bling' you see on newer ones and I wonder if it is possible to improve it with cerium oxide or diamond paste. The dial is one of those mineral types Rado was famous for back in the day. It has an iridescent effect and changes colour from a light green to a dark greenish brown depending on the light. It is especially fascinating in the sunlight. It also has a striated, wood-grain effect. The hands need lume and I should really start looking for a better day-wheel. 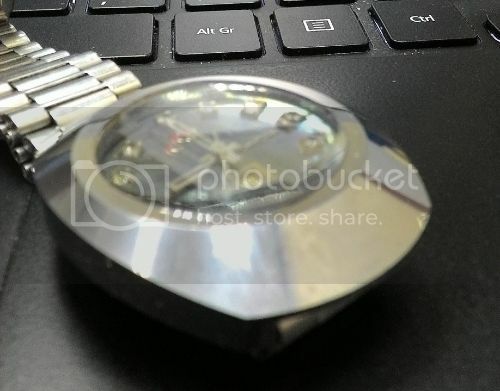 The crystal has little scratches but I'm concerned that polishing will remove the sharp crease.. also polishing will not result in a completely flat surface. Hopfully you can see the narrow flat surface next to the faceted (sapphire?) crystal. This is in better shape than the sloping sides as it is in the shadow of the crystal. Some views of the sloping sides. So I'm thinking about using cerium oxide on the sides... I dont have any diamond paste, would this help? Anybody had success with refinishing these cases using other means? Finally.. I just have to give high marks for Rado's hi-tech cases. The watch must date to the early seventies at least and has seen serious wrist-time, enough to wear away the caseback. 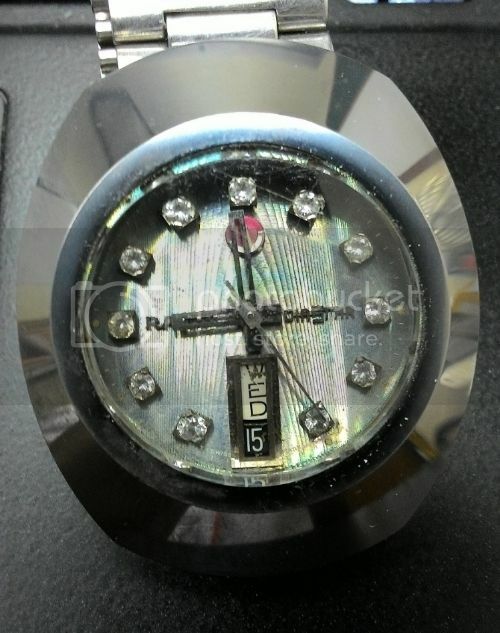 Despite that the case and crystal, while not immaculate, are in good condition. I know that a lot of them met an untimely end as they would crack if dropped but given reasonable care and some luck it should last a long time! Previous Topic: Does price matter if it looks good?